The World Baloch Organisation said the latest drive will see more than 100 London buses with adverts carrying slogans like "Free Balochistan", "Save The Baloch People" and "Stop Enforced Disappearances" from this week. 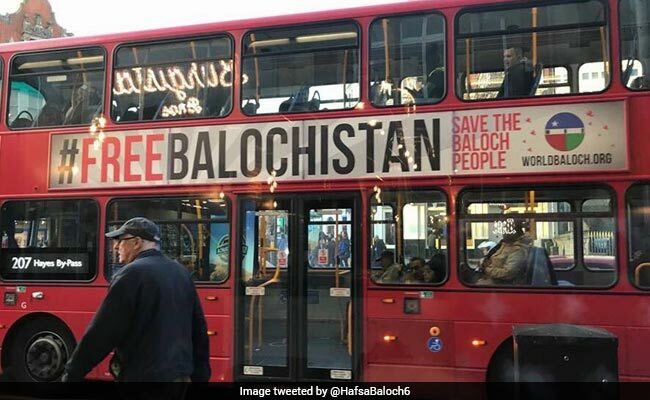 London: Activists campaigning for an independent Balochistan have launched a new phase of an advertising drive on London buses to raise awareness against alleged human rights abuses in the restive province by the Pakistan government. "This is the third phase of our London campaign to raise awareness about Pakistan's human right abuses in Balochistan and the right of the Baloch people to self-determination. We started with taxi adverts, then did roadside billboards and now we are advertising on London buses," said Bhawal Mengal, spokesperson for the organisation. He claimed that the Pakistan government had pressured Transport for London (TfL) to ban the adverts on London transport but it had failed in its "bullying tactics". "This is a peaceful advertising campaign. Pakistan's aggressive reaction is a bare-faced attempt to intimidate the UK government and Baloch human rights defenders," said Mr Mengal. The advertising campaign has been backed by British human rights campaigner, Peter Tatchell, who said Pakistan's attempts to prevent them amounted to "censorship" and anti-democratic. "These adverts are much needed to defend the human rights of the Baloch people and to expose the atrocities of the Pakistani military and intelligence agencies," he said. "Pakistan's iron-fisted rule in Balochistan is so brutal that it will not allow journalists, human rights monitors and aid agencies to enter the region," he added. Baloch people argue that they are ethnically and culturally different from the rest of Pakistan and have been campaigning for an independent nation for years. Pakistan dismisses any notion of a "free Balochistan" as an attack on its sovereignty. Pakistan on November 3 had summoned the British High Commissioner in Islamabad to protest over the "Free Balochistan" slogans displayed on London cabs that it said attacked the country's territorial integrity and sovereignty. Balochistan is the largest of Pakistan's four provinces, but people in the restive region have long complained that they do not get a fair share of its natural resources. "Balochistan was previously a British protectorate that was granted independence in 1947. It was forcefully annexed by Pakistan in 1948 and has been militarily occupied ever since. The people of Balochistan have been denied the right to self-determination, contrary to the UN Charter," said Noordin Mengal, a member of the World Baloch Organisation. The organisation describes itself as a non-violent and democratic international membership organisation dedicated to defending the Baloch peoples' political, social and cultural rights.